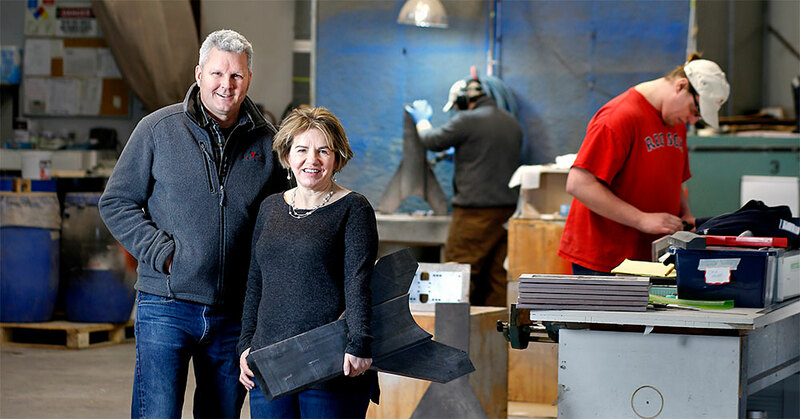 Steve Hassett, president of small Bath-based Custom Composite Technologies Inc., started as a wooden boat builder, but has maneuvered from that historic Maine industry into a new one in which the state is amassing expertise: composite materials. He’s still making parts for boats, but he now uses composites that end up in speedy rowing shells, Oracle Team USA’s America’s Cup yacht, as well as art work, medical machine parts and other uses. Composites are materials made from two or more materials combined to get a desired characteristic like strength of lightness. “We started with boat builders, but now we work with architects, universities and people in automation,” says Hassett. He runs Custom Composite with his wife Maureen, who is vice president and CFO. The company makes product molds and components on contract for others, who in turn build their own products. “The diversification is a good thing for us,” he adds. So much so, that the company won a 2016 innovation award from the Manufacturers Association of Maine. The state’s composites technology is growing about 7% annually, with boatbuilding, marine infrastructure and construction materials being the largest market segments, according to The Maine Composites Alliance. Wind energy, transportation and even some niche applications like defense and fuel cells are expected to gain ground in the future, the alliance predicts. To spread the knowledge of composites, Steve also works with vocational students at nearby Foster Tech, which has a composites technology program. Custom Composite, which hopes to break the $1 million revenue mark this year and add about three workers to its current seven, amassed an even broader range of applications and clients. It built specialized components for Terrafugia’s flying cars and for General Electric Global Research, so it could in turn make specialized parts for testing a renewable energy application. The company also was hired by Zaha Hadid Architects in London to develop sculptures, including a wall relief for an exhibit in Manhattan and the mold parts for a 14-foot carbon fiber, ceiling-mounted sculpture for a private home in Chicago. That ceiling sculpture was modeled after a splash of water photographed at high speed. Hadid architects turned the photo into a computer-aided design that Custom Composite used to produce several molds. The molds were filled with foam, Steve Hassett says, and the foam parts were attached and covered with carbon fiber. A German painter sprayed intumescent paint over it, the type of paint that appears to be different colors when viewed from different angles. “My part of the project was $90,000, plus I installed it for another $10,000,” he says. More recently, Custom Composite is working with the Solar Vehicle Energy Team at the Massachusetts Institute of Technology to create molds for a car that will race in the 2017 Formula Sun Grand Prix. The team is student-run and designs, builds and races solar cars. Custom Composite makes the tooling for the vehicles designed by the team, MIT student Michelle Chao writes in a testimonial to Maureen Hassett. So far MIT has had three sets of molds made for three of its solar cars. “Each time we have been very satisfied with the accuracy and craftsmanship,” Chao writes, adding that Steve’s advice to increase the bonding area for the cars’ structural panels made the attachment stronger and more reliable. “His nickname is MacGyver because he gets things done,” says Maureen. She says the company also develops a lot of prototypes so customers can prepare for volume production. Competition for Custom Composite includes smaller shops still focused on boats, but mostly companies on the West Coast that do similar types of mold-making. Steve grew up on Cousins Island and says he caught the boating bug early. He learned to build wooden boats in Eastport, but also learned about using composites, which for boats include carbon fiber, Kevlar and fiberglass. Different fibers can be sandwiched to make different core materials, he says. After graduating from Washington County Vocational School and The Boat School in Eastport, he worked for custom racing sail boat builder Goetz Custom Sailboats in Bristol, R.I., from 1983 to 1997. Among his work was making cut boats for America’s Cup teams, which are secretive about designs that may give them an advantage. Much of his new business involves making items lighter and better performing. One example, he says, is replacing metals with composites in customers’ components. “Replacing standard equipment with next-generation parts equates to the machine running faster and having less wear and tear,” Steve says. Engineered Automation of Maine, a Biddeford company that makes automated machinery and industrial engineered automation systems for customers’ manufacturing processes, is doing just that with a medical industrial client. EAM makes a set of machines that its customer uses to remove two parts from its own machine and then weld them together. The end result is a sterile pack that protects a tray of three needles and sutures for surgery. EAM’s earlier machines used a metal arm, but Bartlett says a carbon fiber arm would speed up the process of pulling out parts. “We needed a part that was lightweight not just for strength,” he says. “It helps the machine to work faster.” And that translates into building more trays and making more sales because EAM’s machines appear to be more high tech, he adds. That might not sound like much, but since his client runs operations 24-7, saving even one second off of a cycle results in making more parts and paying back the extra cost of the carbon fiber used in EAM’s machine, which is priced at about $1 million. Maureen says Steve is focusing more now on widespread use of composites in other industries. “In the past we saw a lot of high-performance parts built for boats, but not everyone keeps buying these parts so we’re looking past the marine industry,” Steve says. Indeed, Custom Composite’s production manager, Zack Parent, says even those making high-performance boats typically make their own molds as well. Parent previously worked for Sweden’s Team Artimus to build its America’s Cup boat in California. One of its recent branching out projects, Maureen says, is making C-shaped leg molds for robots. They’re part of the “Robot Revolution” exhibit designed by the Museum of Science and Industry in Chicago, sponsored by Boeing and Google and now on display at the Franklin Institute in Philadelphia. “Robot Revolution” includes 40 cutting-edge robots curated from some of the most innovative global robotics companies and universities. More than half of the robots are interactive, including the Maneuver RHex (pronounced Rex) made by University of Pennsylvania students using the C-shaped leg molds from Custom Composite. The RHex is an all-terrain crawling robot. And while the Hassetts didn’t connect all-terrain robots with the military, Maureen says the company is looking to get more business in the defense industry after having one project in that industry last year. Probably one of the more unusual, and everyday, products the company makes is a mold for Jarden Plastic Solutions of East Wilton, which is now called Newell Brands after is was acquired by Newell Rubbermaid Inc. last year. The end product from Newell: plastic cutlery.